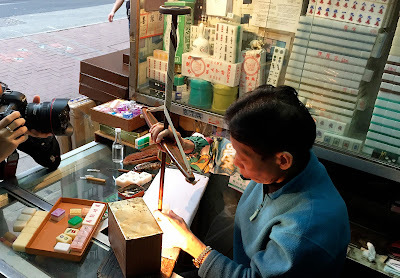 Staying in a dead-end job seems making no sense for most of us and the last Mahjong-carving lady in Hong Kong told me her reasons to stay in such a dead-end industry - carving handcraft Mahjong in Hong Kong. 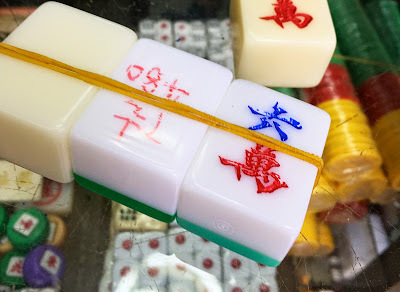 I visited the soon-to-be-redevleoped Hung Hom old town district and stopped at a tiny shop under the staircase of a Tong Lau (means tenement buildings in Cantonese, which were commonly built in the 1960s Hong Kong) That's where I met Sister Mei, the last Mahjong-carving lady in Hong Kong. 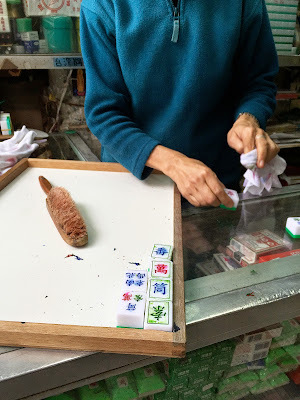 Ho Sau-Mei, well-known as '湄姐' (Cantonese pronunciation: Mei4-Ze2, literally translated into 'Sister Mei' in English) in the neighbourhood, runs an ultra-tiny understair shop selling and repairing handcraft Mahjong tiles. 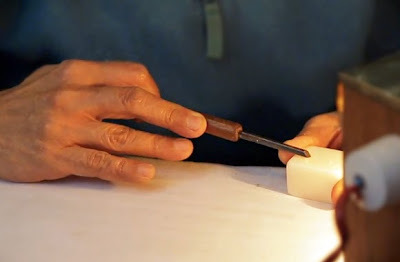 She is one of the three remaining Mahjong carvers in town and the only female carver among the other male counterparts. The shop is owned by her family and she has been working in the shop since she was 13 years old. 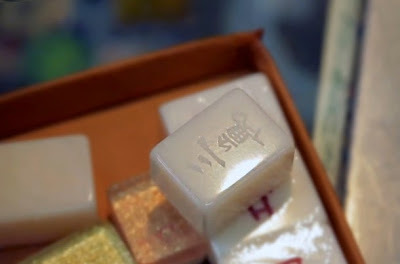 50-ish years passed, with the advanced technology development, like automated carving machine and laser cut machine, demand of handcarved Mahjong tile is dropping like riding on a one-way roller coaster. Any difference between a handcarved tile and a machine-carved(laser-cut) one? Look at the detail and smoothness of stokes. This tiny place means more than just a workplace for her. 'I could have changed my career in 90s but I decided to stay. 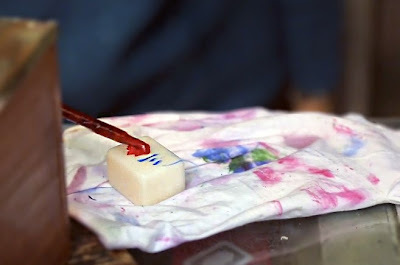 All my childhood memory is here and I feel the need to preserve this traditional art. I also can't imagine what would be the feeling of being retired. Sounds boring as hell.' Sister Mei told me. Currently the shop can't make her a living as her average monthly income is just $4000HKD, which is even lower than the minimum wage in Hong Kong. She received media invitations for paid-appearances from time to time, including some big names from Mainland China, but she would kindly reject the invitations if travel is required. 'Why?' I screamed a bit inside but remained my monotone voice. 'I prefer to stay in my neighbourhood. I could make some quick cash out of those TV shows but I would lost the chances to talk to my customers. They are like my old friends instead.' She said. Her shop will have to close down when the urban redevelopment scheme carried by government arrived in. Just two streets away, shops are already closing down and residents are moving out. 'Will you stay? Like... until the very last day of this shop?' I asked. 'Why not! There are many reasons for a person to leave a career. Salary is usually not the main reason unless a person is facing an extreme financial hardship, which is not my case. Salary is just an excuse people nowadays loves to use (when they have been asked the reason why they would leave their job). If you have the passion, you can overcome a lot of difficulties. Of course, it takes extra encourage to stay for a dead-end career like mine. Haha....' Sister Mei laughed. Note: There is no official business hour but visitor should have a good chance to see Sister Mei there from 11:30am - 6pm daily. Sister Mei occasionally helps local NGOs for cultural workshops and shares with public about this dying art. She has my deep respect. I always have a feeling getting a balance in urban development and conservation isn't that impossible. My name is Nattaporn and I am a designer with the Multimedia People Private Limited. My company has been tasked with developing multimedia content for the rejuvenation works at the Chinatown Heritage Centre (CHC). Just a bit more about this project, the Singapore Tourism Board's CHC on 46, 48 and 50 Pagoda Street is undertaking a revamp, with the addition of new galleries, artefact and stories. One of the Galleries Roots & Early Life in Chinatown pays homage to a time of enormous social and economic change. There will be an interactive touch screen that invites visitors to learn more about the early days in Chinatown, focusing on the different ethnic groups and how they settle harmoniously. While doing research on the internet, we came across pictures from your website which are relevant to the topics which we will be covering. Hence, we hope to gain permission from you / your organization to include them in our interactive. Thank you for considering my request thus far. Please feel free to contact me at nattaporn@mmpeople.com.sg, if you require more information, Alternatively, I would be glad to meet up with you, at your convenience, to discuss this further.